The story of the letter is nearly as interesting as it contents. It was left to a church as part of an estate. Fire destroyed the Watertown, NY, church in 1985 but the letter miraculously survived (along with other historical letters) inside a metal case and, adding to the miracle, someone sifting through the ruins realized its value and saved it. 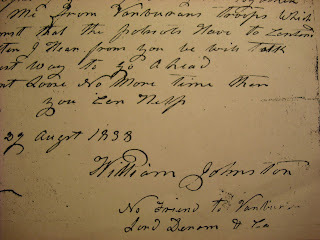 The letter is the only sample of Johnston's handwriting, writing style, and grammar I have found. Photocopies in Johnston's flamboyant scrawl are available at the Thousand Islands Museum in Clayton, NY. Mystery: Where is the original? The Church attempted to sell the letters to collectors. Did someone buy the Bagley letter or was it donated to a museum. If you know, please let me know. 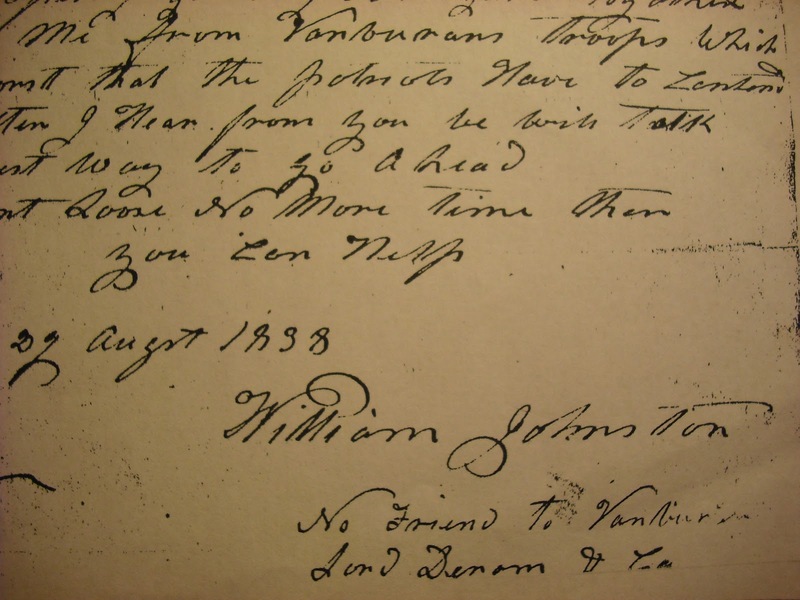 Johnston's letter is devoid of commas and periods, and he capitalized a majority of the nouns. The following is "translated" using modern punctuation and capitalization. It is not easy to decipher the handwriting. A few words are my best guess at what he wrote. I retained obvious spelling and grammar errors to prove a point: that he surely had help writing letters designed for publication, such as his famous proclamation of war in June 1838. Mr. Bagley – I wish to know the first opportunity what is to be done with the Patriots and if they intend going anew this fall. If they do, I want to go and get me some rifles made. I will rais (sic) me one hundred rifle men and keep them one year and it shall not cost the parties over too (sic) thousand five hundred dollars, all the expenses for the year, and I will warrant that they shall kill four times their number of Tories and give you their scalps if you shoud (sic) whant (sic) them and them of no lower class of gentry than a justice of Sir Lordships appointed to administer Tory justice & from that to a Canada of militia & regulars. I suppose if they go a nigh, you will be the won (sic) we will have to look too (sic) for funds and you the won (sic) I shoud (sic) look to counsill (sic) with, for I am sure that Canada can be pressed down within one year from this, so that you can form a better government than we have at present in this country. Nothing shall be left undon (sic) by me that I can do after I get my own gard (sic) together to protect me from VanBurens (sic) troops, which is the worst that the Patriots have to contend with. After I hear from you, we will talk of the best way to go ahead. Don't loose (sic) no more time than you can help. No friend to VanBuren or Lord Denom & Co. Note: VanBuren refers to President Martin Van Buren. Lord Denom likely refers to Lord Durham, governor of the Canadian colonies.